Colored Hair Protective Conditioner is produced by the Italian beauty brand INSIGHT. It is specifically designed for dyed hair. The product nourishes the hair and repairs its structure. It creates a thin protective layer on the surface of the hair, preventing brittleness and making combing easier. Protects hair colour. Made in Italy. 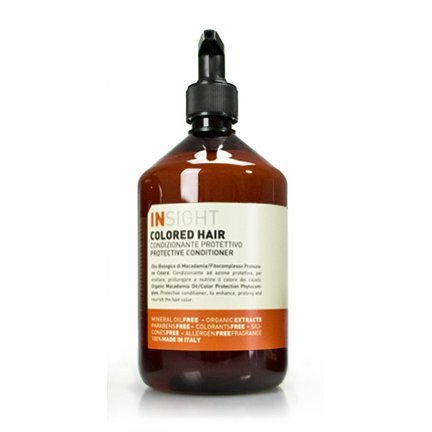 Colored Hair Protective Conditioner is designed to take care of coloured hair. Its intensive formula contains natural ingredients which effectively protect and repair dyed hair, make it tamer and healthier, restore the hair’s natural shine. The key ingredients of the product are macadamia oil, grape seed oil, mango seed butter and henna extract. These ingredients provide the hair and scalp with nutrients, have a softening and restoring effect. Grape seed oil, henna leaf extract and mango seed butter comprise a special protection complex designed to protect hair colour and prevent it from fading. Free of petrolatum, parabens, silicones, colourants, allergens. Directions. Apply onto wet hair, spread along the entire length, leave for 3-5 minutes, thoroughly rinse with water. Ingredients. Aqua (Water), Cetrimonium Chloride, Cetearyl Alcohol, Myristyl Alcohol, Macadamia Ternifolia Seed Oil, Vitis Vinifera (Grape) Seed Oil, Mangifera Indica (Mango) Seed Butter, Lawsonia Inermis (Henna) Leaf Extract, Parfum (Fragrance), Citric Acid, Magnesium Nitrate, Magnesium Chloride, Methylchloroisothiazolinone, Methylisothiazolinone, Sodium Benzoate, Potassium Sorbate. Want to buy Colored Hair Protective Conditioner? Call us or submit your order via our web site! Natural bio cosmetics INSIGHT are produced in Italy by ELEY s.r.l. The company is based in Bologna. It is widely known for its unconventional and innovative formulations of hair, face and body care products as well as for the ethical choice to work using organic ingredients. ELEY s.r.l. manufactures high-quality beauty products for both domestic (Italian) and foreign market. There is a number of reasons to try the company’s products. They include, but are not limited to, high quality standards, excellent technical equipment of the production facilities, and an innovative approach to the development of product formulations. ELEY s.r.l. offers a wide range of products for all skin and hair types. INSIGHT is a professional hair care line. It is one of the company’s most popular brands. The INSIGHT products are formulated with natural oils and certified organic plant extracts. They are free of SLS/SLES, petrolatum, silicones, parabens, and colourants. They are hypoallergenic and completely safe for your health. The series includes hair care products, hair treatments, styling products, and hair colouring products.